Will this flying saucer transport solve Manila\'s traffic? 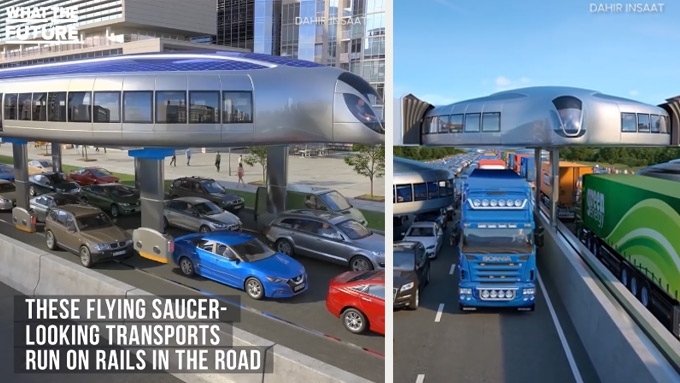 Is this flying saucer transport the answer to our traffic problem? Do you think this flying saucer transport system can solve Manila's traffic woes? Manila traffic has been an age-old problem, and it's getting worse along EDSA. The Metropolitan Manila Development Authority's (MMDA) color-coding scheme and no-window-hour policy have done little to solve the problem. MMDA also has closed a number of U-turn slots, but to no avail. And its latest recommendation to ban driver-only vehicles from EDSA only drew flak from motorists. Senator Leila de Lima, in her statement published by ABS-CBN News, said Indonesia implemented a similar scheme, but the "peak-time rule of three people to one car" did not work. Highway Patrol Group's stricter yellow lane rule has helped ease the congestion a bit, but there are just too many vehicles plying the narrow EDSA stretch at any given hour the problem seems unsolvable. Is there a way car ownership can be regulated? How about this second-level transport, which looks like flying saucers? Can it ease the traffic on EDSA? According Dahir Insaat, the Turkey-based company that filed a patent for this concept vehicle, it is cheaper to build it than a new subway system. Its operation is also "completely electric and has roof-mounted solar panels." In the meantime, we wait for President Rodrigo Duterte's Build Build Build program to complete its infrastructure projects by 2022. The Department of Transportation (DOTr) proposed a cable car system last May, but it was also met with skepticism.